–One who vigorously supports his school and its Christian way of life. The Liberty Prep Patriot holds his head high. He is looking and moving forward, blazing new trails, preserving freedom and carrying the flag to future generations. 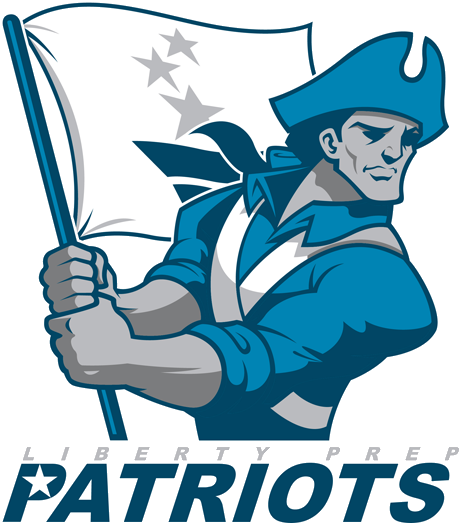 The Patriots embodies the 9 core virtues Liberty Prep Christian Academy holds to be true. Faith: Faith is at the center of the Patriot’s heart. His flag carries the torch with three stars, representing the Christian Trinity. Above all, the Patriot is faithful to God, his family and his fellow Patriots. He has the courage to stand for what is right and true. Compassion: The Patriot is strong, yet compassionate. He is always willing to lend a hand to those in need. Giving: Giving is a way of life for the Patriot, even if it means giving it all. It is an honor for him to serve. Respect: The Patriot shows respect for fellow Patriots, elders, those in authority and all of God’s creation. He does not take anything for granted, but is grateful, appreciative and courteous. Responsibility: The Patriot’s shoulders are broad and strong in order to bear the responsibility entrusted to him. He does what is right, even when it is hard or unpopular. Self-Discipline: The Patriot’s furrowed brow denotes his commitment to excellence. He is regimented to take care of himself physically, mentally and spiritually. Loyalty: The Patriot is true to his cause and to one another. Honesty: The Word of God is Truth. The Patriot preserves truth and honors it at all times.